Dazzle Me Slot: Spin Dazzling Gems And Win Big! Dazzle Me Slot Is Full Of Precious Gems And Free Spins! who are known for some of the most popular slots online. In this game, you will be spinning five unusual reels stacked with hot gems, giving you the chance to win big and perhaps buy some of your own. The gem-stacked reels have a golden frame and the soundtrack fits the theme perfectly. It is as bright and light as the visuals. The symbols are mostly gems in different shapes and colors: triangular pink, rectangular blue and red octagonal gems. There are also the traditional slot symbols of the bell and the lucky number 7. 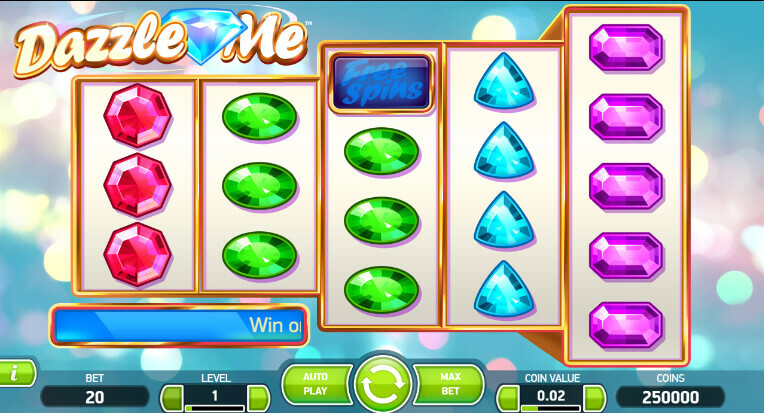 Dazzle Me slot is a colourful game with a clear, singular theme: precious gems. The music and sound effects are upbeat and help create truly dazzling casino play. You will be spinning five reels, each with a varying numbers of rows. The first two reels have three rows, the next two have four and the fifth reel features five rows. In total, the game offers 76 paylines. You can set the coin value from 0.01 to 1.00 before each spin. Your highest paying symbols are the slot machine classics of the bell and the lucky 7, which offers the jackpot of 200 times your bet. There is also a free spins symbol, that can land you up to 16 free spins. A unique feature is the linked reels that appear during the free spins round. Identical linked reels will appear on any of the reels one to four, helping you to land a good money payout. Dazzle Me slot is available on mobile devices, like your iPhone or Android smartphone. Free spins make a big difference to anyone's slot strategy. In Dazzle Me, bonus spins are awarded when you land at least three of the free spins symbols anywhere on the reels. If you manage to land five symbols, you will be awarded 16 spins at no extra cost! Link Reels And Win Great Payouts! Dazzle Me slot game has a bonus feature that links reels in the free spins round. At the start of every spin, identical reels appear linked to each other on any of reels one to four. This will be a great help to secure a big win! Hit The Jackpot And Shower In Gems! A hefty jackpot is the dream of every slot player. 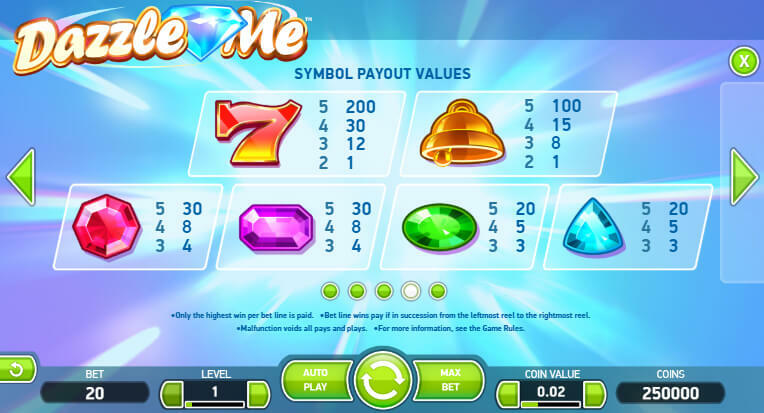 In Dazzle Me, the jackpot is secured by landing five of the highest paying symbol, the traditional slot machine number "7". Five of these on the same payline will reward you with a payout of 200 times your bet! 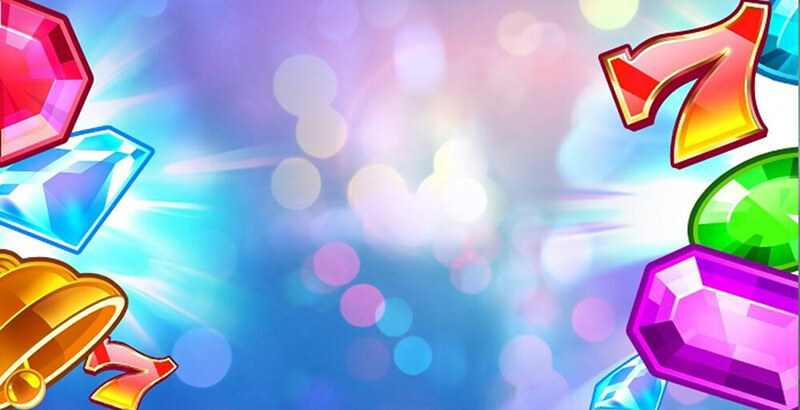 Dazzle Me slot is a brightly sparkling game, that offers somewhat unconventional gameplay. You spin five reels, which have varying numbers of rows. During the free spins feature, you will have the benefit of linked reels, helping you towards that elusive big win. With its upbeat music, Dazzle Me makes for a fun and entertaining gaming experience and is a must-try for anyone who loves classic slots! AboutSlots lists the best casino providers online today where you can play this game. You will also find reviews and guides for slots and table games on the site and where to find the best casino games or deposit bonus. You can also benefit from tips on game strategies and everything else casino related.